George Martin was impressed enough by The Beatles' debut session for EMI on 6 June to offer them a recording contract. However, he was less pleased with the band's drummer, Pete Best. Getting rid of Best was not an easy decision. The Beatles' manager Brian Epstein had asked Cavern DJ Bob Wooler if it was a good idea, but Wooler told him that the handsome Best was too popular with the fans. Brian Epstein told me that Pete Best was going to be sacked. I could imagine it with someone who was constantly late or giving him problems, but Pete Best was not awkward and he didn't step out of line. I was most indignant and I said, 'Why are you doing this?' but I didn't get an answer. Best had been with the group since 12 August 1960. He was never given a reason for his dismissal, which took place at 10am on this day at Epstein's NEMS record shop. Best was dropped off at 10am by the group's driver, Neil Aspinall, who was in a relationship with Best's mother Mona. Neil drove me into town and dropped me off in Whitechapel. I found Brian in a very uneasy mood when I joined him in his upstairs office. He came out with a lot of pleasantries and talked anything but business, which was unlike him. These were obviously delaying tactics and something important, I knew, was on his mind. Then he mustered enough courage to drop the bombshell. I was stunned and found words difficult. Only one echoed through my mind. Why, why why? 'He's joining on Saturday,' Eppy said. I suppose I should make an effort to find an original recording with Pete (I suppose the Love Me Do from the Decca session might be a candidate). If Pete had chops and was let go despite this, one might think there was something a bit under-handed about the change. He’d been in the trenches with the band for some time, and perhaps this was forgotten. Hard to dispute GM’s judgement though, and Ringo definitely fit musically. He’s on several of the Anthology 1 tracks. IMO he wasn’t by any means a terrible drummer, and it was probably mainly his personality that made The Beatles want rid of him. I read somewhere that his success with female fans led to some conflicts with the other band members, though it may be a bit more complicated than that. I can imagine Pete’s awful predicament as he witnessed their rise to fame and fortune while he sat on the sidlines. At least John admits to feeling bad about their inability to face him personally and do the deed themselves. Respectfully, but strongly, disagree. Pete wasn’t a terrible drummer- but he clearly wasn’t good enough, either. Compare the three recorded versions of “Love Me Do”- Pete’s drumming is pretty plainly not as good as either Ringo’s, or Andy White’s. His reserved personality, and lack of emotional cohesion with the rest of the band didn’t help- but it was his limited drumming skills that got him fired. That’s right, Pete wasn’t a bad drummer but he was pretty one dimensional. Look at the creativity in the drums on “Tomorrow Never Knows” and the intro on “Ticket to Ride”. In the former, the drums are really the instrument that creates the entire mood of the song. Could Pete Best come up with that? The three guitar-playing Beatles really developed their skills in the long hours of boozing Hamburg halls. And the drums were a dimension that wasn’t keeping up–particularly as the John and Paul started introducing their own songs into the act. Ringo brought was significantly more accomplished skill set and after he joined, the others noted that the Beatle sound was now complete. There was 2.5 months from the on day recording session at Abbey Rd to Best being fired. If Harrison (the hawk), McCartney and Lennon had approached Best of his drumming and talked about it and Epstein approached George Martin, Best would have remained the drummer. They had been turned down by all record companies and were on a knife edge. They clearly panicked. Naivety is the word. BTW,the contract between Epstein and The Beatles was signed in Best’s house. Saying all that. Best was too shy. He always held his head down and turned his eyes upwards, as if he didn’t want to be in the public eye. He never said much. Imagine him in the Press interviews in the USA that made the Beatles stand out as personalities. He was not outwards and witty like Starr. Starr was in the end the perfect man for the job. It was either contract or Best. And he was — in total contrast to the others — non-social. The Beatles had got to know Ringo in Hamburg. And they increasingly hung out together. And in jam sessions, he’d sat in. He had the personality. And his drumming was perfectly suited. Nail on the head. THAT interview is what cemented the bands image and personality in the eyes of the American public. This was the reason Martin signed them. Listen to him in his own words. He states that tbe tape Epstein brought to him was frankly ‘pretty awful’ there was nothing about their music which made them stand out. He further states that if he had known that they had been rejected by every record company in London , he would have told Brian thanks but no thanks. However he didnt know this and as Epstein was being so persistent he agreed to meet the band in person and see if he would reconsider. Reconsider he did and the reason again was NOT their music but their personalities. His impression was that after he had met them they had made him feel good and he thought if they can have that effect on me they can have it on the public. Thats the reason they got signed and thats the reason Pete got ditched. I know you ever notice how Best ALWAYS looks awkward in all of the pics? He looks like the odd man out for sure. Best got done dirty, but eventually became a millionaire from the ‘Anthology’. This was due to Neil Aspinall, who had a relationship and a child with Mona Best, Pete’s mom. In Hamburg, Best didnt turn up to every gig (anthology) so they had to use no drummer, or Ringo when he was there with Rory storm…says it all..
That’s not entirely fair……he missed about 2 gigs the whole time they were in Hamburg. Either due to illness or some other important reason that was out of his control. George also missed a few gigs and John was nowhere to be found at one performance. You gotta remember they were young lads in a very “naughty” part of the world, god knows what they got up to. At least they had a great time doing it!!!! John Lennon said that Pete Best was a good drummer but Ringo was a better Beatle. I have read that Paul used to get Pete to try to do anything different with the kick drum instead of just the 1-2-3-4 beat he layed down for all songs. I have been drumming for close to 40 years and can say from the little drumming available to hear of Best, he is not very good at all. While Ringo is not technically good, he is light-years ahead of Pete in terms of driving a song. Pete Best Of The Beatles – The Greatest Rock ‘n’ Roll Story Never Told -DVD NEW. It has interviews with the major players of the era including DECCA & Parlophone executives. The whole George Martin “reason” given that he wasn’t good enough was blown out of proportion and has been used out of context for many years. It was just the “excuse” they used to kick him out. The video tells 90% of the story and that’s only b’coz Pete was never given a/the real reason(s) for his dismissal. It was George Martin’s critical comment that (finally) brought the issue to a head. Are you saying that you’re better than ringo? No.I’m saying that i’m better than Ringo! Imagine a group called the Beatles featuring 2 drummers. Light years ahead of other groups like say the Allman Brothers in the 70s. Just IMAGINE. There was room for Pete. This was obviously a group shafting.I’ve always believed cream will rise to the top no matter, and any fear of not getting”signed” to a label was lame at Best. No pun intended. Just a thought. … loved the guys but feel this was horribly inexcusable. Can only chalk it up to their gullibility from above. The whole music business was obviously getting to John the way he criticized everything later on. Carry on……. THAT’s why they sacked you Pete. They DID believe. Also, he was a boring drummer with no feel. Listen to the Decca auditon from New Years 1962 and then listen to Live @ Star Club recorded less then a year later. Tell me that isn’t a MASSIVE improvement in energy. I hear there was somehow a debate over who actually played drums on it but to anyone that’s a musician or has played drums… it’s very obviously a completely different person with a completely different style. The truth is Pete was damn lucky to have been able to play with them at all, which is more then the rest of us ever will. He was at the right place at the right time and was there when they were desperate… and his mum had money and influence in the neighborhood. Interesting debate by all. Personally I think it was both the mediocre drumming and inability to fit in that made a change necessary. And Ringo developed into the perfect fit. If Pete was interested in succeeding, he would have been more compliant with Brian’s wishes for their direction as well as lose the ‘moody’ cloak. It was an act of backstabbing. But that was history. Nothing can be done to change this. In retrospect: The Beatles without Ringo is unthinkable. Joh, Paul, George and Ringo are the Fab Four (gladly). the reality is this; they needed a drummer to go with them to Hamburg. Best was the only guy they could grab at the last minute to go with them. He could barely keep a beat, but they were just happy to have someone, anyone to fill the spot. He was never very good, and of course it showed when it came to recording. They needed a real drummer, so they could progress as band. And that’s the cold hard truth. People get fired all the time from jobs. Just so happened that the Beatles became the biggest band in history. I don’t know why this is so hard for people to accept. I don’t doubt Ringo was a better drummer, Best was a bit old fashioned and not nearly so imaginative, but he must have been at least ‘adequate’ live. 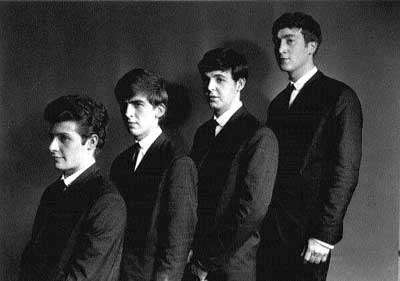 The truth is they treated Pete Best very shabbily. In order to justify their treatment, they then bad mouth his drumming after the event. Nasty. Pete’s playing was generic for the time…..it was sufficient, but, not distinctive and different, like Ringo’s was. Don’t forget…George Martin didn’t like Ringo EITHER and he brought in Andy White…thank-you very much! The three Beatles instinctively knew that Ringo’s style and sound fit them a lot better…he was left handed playing a right handed kit … that led Ringo into producing different, and sometimes awkward beats on the drums which Lennon and McCartney just hammered along with LOUDLY, actually creating the true “Rock and Roll” genre we know today. Best NEVER would have done that ! Ringo ROCKED ! !…BEFORE ANYONE ELSE !! The other 3 NEVER would have played as well as they did without Ringo driving them to a new level. Regardless of the real reason why Pete Best was fired it was completely spineless and despicable of them not to have honestly told him face to face rather than deciding and arranging things behind his back.